Yep, it’s happening. A rhubarb invasion on the blog. Prepare yourself. When planning out recipes for the month of June I was plotting many ways to feature rhubarb. It’s such a curious plant and I just had to employ it. My first memory of having rhubarb was during a road trip I took with my friend Ashley years ago. After touring 7 states we landed at her parents’ house in rural Idaho where their garden was abundant with the stuff. While Ashley’s mom made us dinner one evening, her dad baked a pie: strawberry rhubarb. It was so delicious I knew I had to get my hands on some and try it for myself. The funny thing about rhubarb is, it’s elusive. It doesn’t peek its head until late April, early May and only remains seen for a certain stretch of summer. Which is why I was anxious to get my hands on some come spring. Well, after multiple phone calls to area grocery stores and failed attempts at picking some up at markets, I finally spotted some and when I did, I stocked up. Consider this the first of at least two rhubarb recipes in June if not more. They’re made with whole grain pastry. They’re flaky and perfectly sweet. They’re loaded with rhubarb and strawberry compote. 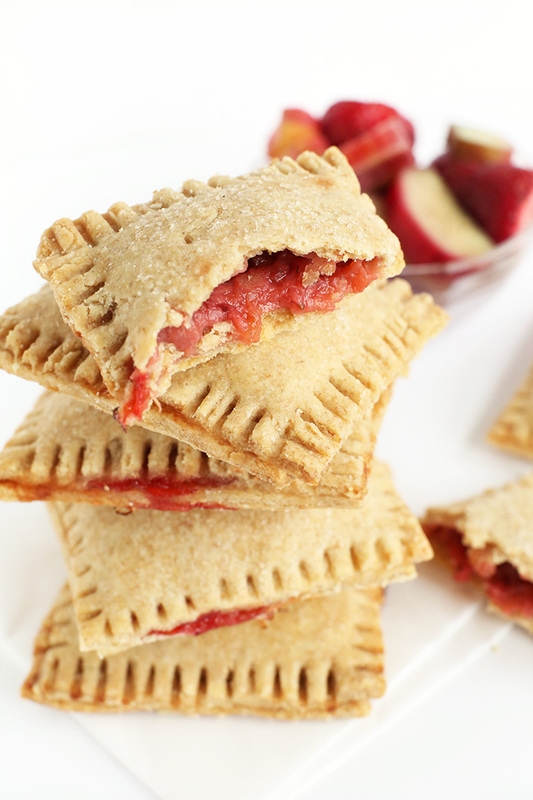 They’re adapted from my Vegan Berry Pop Tarts (a must try). They don’t need frosting but, why not? Life is short. You simply must try these pop tarts. They’re the perfect way to celebrate summer fruit and indulge in a little something sweet. If you do, snap a picture and tag it #minimalistbaker on Instagram. You guys know I love it when you show me what recipes you’re making from the blog. So get to baking and then get to Instagramming. Cheers! 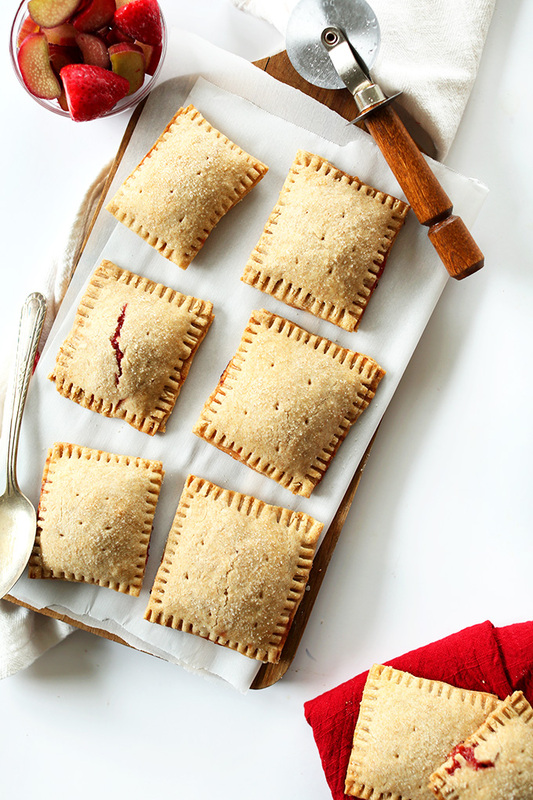 7-ingredient vegan pop tarts made with whole grain pastry and strawberry-rhubarb compote. Simple, fast and perfect for using up spring and summer fruit. Prepare the compote by placing rhubarb, strawberries, raw sugar, and orange juice in a small saucepan over medium heat. Cover and cook for 10 minutes, stirring occasionally and smashing down with a spoon to muddle the fruit together. If it bubbles too much, turn down to low heat. Transfer to a bowl to cool. In a large bowl, mix flour and salt, then cut in butter with a fork or pastry cutter until well combined. Drizzle ice cold water over the mixture in 1 Tablespoon amounts and mix with a wooden spoon until it starts to form a dough. It usually takes about 2-3 Tbsp, but you may need to add up to 5 Tbsp (amounts as original recipe is written // adjust if altering batch size). It should be moist enough to form into a ball, but not too sticky to handle. Add more flour if it gets too wet. 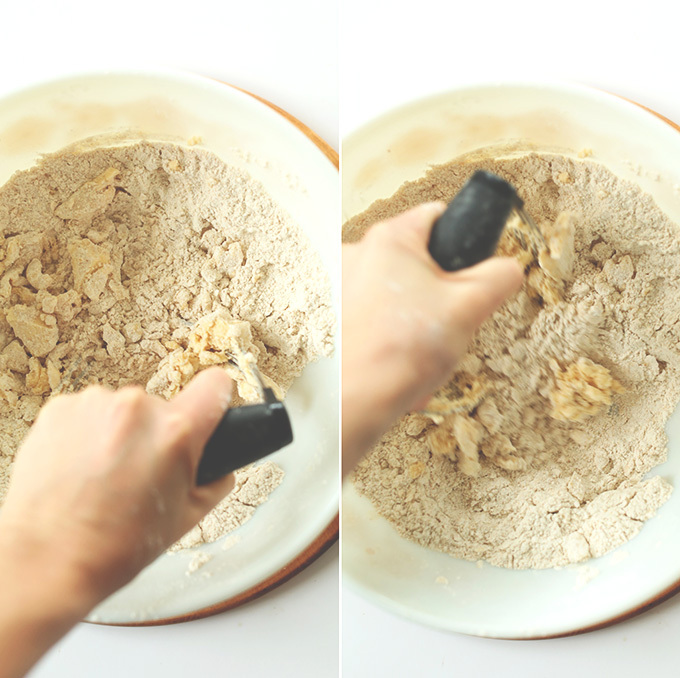 Turn onto a floured surface, gently shape into a disc, and then use a floured rolling pin to roll into a large rectangle. I find it helpful to place a sheet of plastic wrap over the dough while rolling to reduce cracking. Cut into 16 equal squares (amount as original recipe is written // adjust if altering batch size) and carefully transfer to a baking sheet. My first attempt, I got 12 squares. Then I rolled out my scraps and got four more! Place about 1 Tbsp of the fruit filling onto half of the squares, leaving a 1/4 inch border to seal the edges. Then use your finger to run water around the edges so the two squares stick together. Top the squares with their matching halves and then seal lightly with a fork. Poke a few holes in the top of each pop tart, brush with a bit of melted vegan butter, sprinkle with raw sugar (optional), and bake for 20-25 minutes or until golden brown. Let cool and then top with glaze if desired. To prepare glaze, simply whisk together melted vegan butter, powdered sugar and add juice 1 teaspoon at a time until desired consistency is reached. The glaze is not necessary, but recommended for sweeter pop tarts. Store leftovers in a covered container at room temp for up to a few days. This recipe is wonderful! Thank you! Just made my second batch and have some compote left over and I would love to make another batch some time soon. How long do you think it will last in the fridge? Thank you so much!!! My daughter is vegan now but used to love strawberry/rhubarb pie. I made this today for her 21st birthday and she loved them. They came out so cute also. Very easy to make – thanks for the recipe! Would love to make this but the only flour I have on hand is buckwheat. Is that an OK replacement? Hi Carly! We haven’t tried making this recipe with just buckwheat and can’t say for sure. If you give it a try, report back! Can I freeze these to keep them longer? Hey Sydney! I think that would work! Is it possible to substitute oil instead of vegan butter? Unfortunately vegan butter is not available where I live and I’d like to keep them vegan. Will this recipe work with regular butter instead of vegan? Looks amazing! I would really love to make these, but I am a little confused about the amount of flour. Is it 2 cups whole grain, 1 cup white? Or is the white just for flouring your rolling surface? I’m sorry, it seems others figured it out, but there appears to be a typo in that area, and I don’t want to mess up the recipe! Thanks! Ah! I see what you’re saying. I’ll fix that. It’s 2 cups flour total. I use 1 cup unbleached all purpose, 1 cup whole wheat pastry. Sorry about the confusion! Any chance these would work using GF flours? I haven’t tried it, but yes it probably would. You just have to be extremely gentle! Just made these and I’m so excited to try them! My bf loves rhubarb and poptarts. He hasn’t had a poptart in forever because of their ingredients. This is so perfect and was so easy to make. How have I been a vegan foodie for 3 years and not found your site until this week? And honestly, are you trying to kill me? I cannot make all of these recipes, but I’m sure gonna die trying. I can’t promise I’ll be able to fit through the door when I’m done. It’s almost like you knew that I used to be a pop tart addict. I read many vegan food blogs and yours is my new fav. Thank you, thank you! Ah, thanks Anne! So glad you found us and are enjoying the recipes thus far. Hugs! I’m not sure we use rhubarb here in Italy, I certainly have never seen in the market here in my area so I used raspberries and blueberries for the compote and they are delicious! great recipe even though I had to change the filling completely! Hopefully one day I’ll find rhubarb and try the original recipe. I just found your website and your recipes look incredible! I keep clicking on one only to find another recipe that looks more mouthwatering than the last! 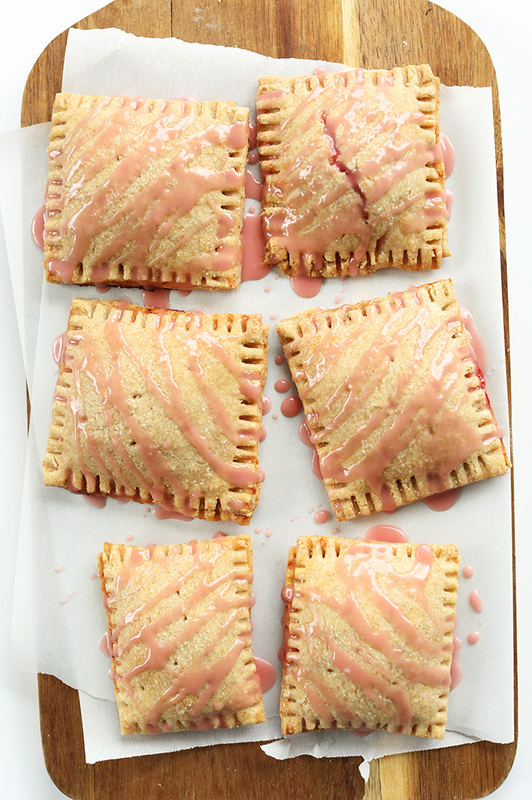 I can’t wait to try the vegan peanut butter swirl brownies, these pop tarts and the apple breakfast streusel pizza! soo…i just put them in the oven. but the filling was so runny! When i tried to close the edges, the filling was coming out for almost all of them, and i left an edge to close them. Do you think the filling was more juicy because i prepared it last night and put it in the fridge? i got it out today early, so it would be at room’ temperature, and it was so i don’t see what it did wrong. is it because my squares were too small? i could do nine and i had a bit of dough left. i’m sure they’ll be delicious, but for the esthetics, well i think i’ll pass! also, when i poked the holes gently, some dough broke and more filling was coming out of the edges. please help so i can do better next time! thanks! begged my sister for some of her rhubarb to make these. I’ll try them tonight! Just made these- I had leftover frozen pie crust in the freezer so I took the even easier way out… Next time I’m using your dough recipe though- they look like they’ll be even more delicious than the ones on my counter now! I have been dreaming of strawberry rhubarb pop tarts since last summer when I had one from the Cinnamon Snail food truck. These turned out delicious, and it was first time I’ve ever tried baking with rhubarb! Thank you for this amazing recipe! I love rhubarb! I just posted a recipe and video for a cherry rhubarb crumble on my blog! mmmmm! Lovely! Yes, and I’m not sure where you stand on vegan butter (I’m personally OK with it in moderation) but these will likely also work well with coconut oil! I am now craving these with some kind of peanut butter icing. Yummmmm. Thanks so much for sharing! Amaaaazing! I better get to picking my rhubarb! Finally, an alluring and healthy pop-tart! Love the strawberry/rhubarb combo. I’ve contemplated buying whole-wheat pastry flour for awhile now, and I think you’ve convinced me. Rhubarb is definitely so elusive. There’s a restaurant here in SF called Foreign Cinema that makes their own version of pop tarts too, but they aren’t whole wheat, nor do they take advantage of rhubarb season! Yumm what a great idea. Looks so delicious!! I’ve made similar bad boys with raspberries in a spelt crust. Rhubarb is best friend with EVERYTHING! I keep seeing rhubarb recipes everywhere and I am dying to try it! 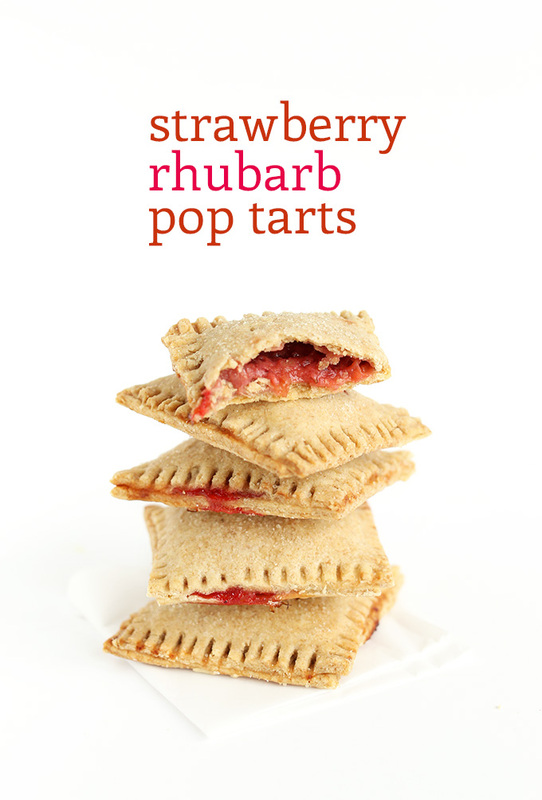 These look amazing – what cute little pop tarts!! The rhubarb looks totally amazing! I would probably just end up making a double batch of the filling, and using the rhubarb on top of pancakes or french toast – mmm! Smart! I did the same, only put it on oats! Can I substitute anything for the vegan butter? Perhaps coconut oil, but I haven’t tried that myself and it may not work quite as well. But if you do, make sure it’s solid (not melty). Hope that helps! These look wonderful, I’ve always loved the look of pop tarts, especially these. RHUBARB! My love! 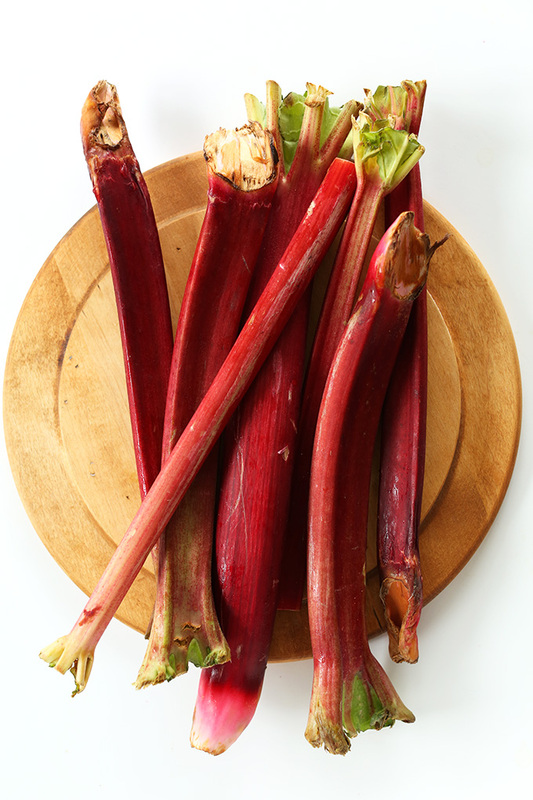 The first time I ever had rhubarb, I was about 4 and I ate it raw out of a neighbor’s garden. Ick! Definitely do not recommend this method of preparation! ;) Much better with strawberries in PIE! Yah, rhubarb! We had a big rhubarb plant when I was growing up and every summer we got to eat rhubarb crumble and rhubarb pies. It was glorious! Rhubarb really is such a weird little plant, it tastes so bizarre before it’s cooked and sweetened. Thanks for the recipe. PS: Thanks to you I’ve been checking out the minimalists and the other blogs about minimalism that you recommend. Thank you so much, it’s exactly what I needed! Aw, that’s great news! Such great resources on minimalism. Cheers! These sound awesome, and I am totally hungry now! I love your food as art and minimalist approach to food and life. Thank you for sharing your life on the blog! Thanks, Dana! I have been waiting for a great recipe for rhubarb. Didn’t want to do a pie. How could one not enjoy being Vegan with all the great recipes (and information) you provide? Brilliant plane snack ;D More rhubarb goodness coming next week :D Hope your trip goes well, friend! Oh these look delightful!! 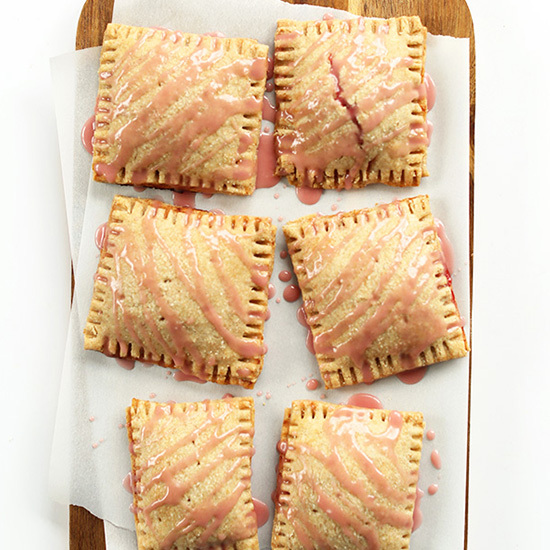 Strawberry rhubarb pop tarts…and they’re vegan?! Doesn’t get better than that! Oh man, all these rhubarb posts are taunting me. I have never had rhubarb before and we don’t get it here in Dubai. I’m so curious about its flavour. All I know is that it has a luscious red colour and pairs well with strawberries. What else… WHAT ELSE?? Grew up here, actually! Thanks for the tip; must try it out. I wish I could give you some of my rhubarb. I have SO much right now! I just made rhubarb rye scones with them, then I made a sour cream rhubarb cake, now today I’m making strawberry rhubarb pie with my grandma. And that won’t even be the end of it! Rhubarb literally grows on every block here in my little town. These look so yummy!! Might have to try these too! Although I don’t have any pastry flour.. only regular whole wheat. That’s so awesome! Super jealous. If I lived near you I’d fill up my trunk! I love rhubarb and this recipe looks absolutely wonderful!